Rock wool insulation, also known as mineral wool, is a close relative of fiberglass insulation. Manufactured in batts and blankets just like fiberglass insulation, rock wool has a coarse, fibrous texture that’s similar to spun fiberglass. The most common type of mineral wool insulation for residential applications is a grey or grey-brown batt that comes in different thicknesses and widths, just like fiberglass batts. Most of the mineral wool insulation available in the U.S. is made primarily from slag wool –a waste byproduct of steel manufacturing. Because of its high recycled content (between 75% and 90%), mineral wool insulation has good green value. With an R-value between 4 and 4.3 per inch, mineral wool has slightly higher insulation value than most fiberglass insulation. Heat resistance is also superior to fiberglass; mineral wool won’t melt until temperatures exceed 2000 degrees. Mineral wool has excellent resistance to mold and moisture damage. It absorbs little or no water and won’t compress or fall out of place if it gets wet. Just like fiberglass batt insulation, mineral wool batts can be faced or unfaced. Handling and installation details are also similar to those for fiberglass batts. 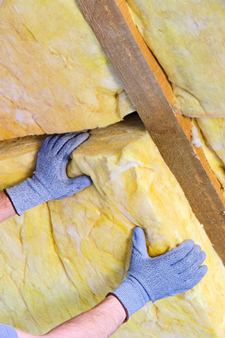 Not all insulation contractors have access to this material, so you’ll need to contact a full-service insulation contractor to find out more about using rock wool insulation to improve your home’s energy efficiency.